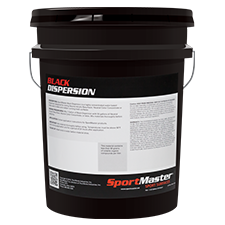 SportMaster Black Dispersion is a highly concentrated water-based pigment dispersion designed for tinting Neutral Acrylic Resurfacer, Neutral Color Concentrate or latex used in latex and rubber running track surfaces. Black Pigment is a highly concentrated water-based pigment. SportMaster Pre-Dispersed pigments are water based pigment dispersions designed for tinting latexes used in the construction of latex/rubber running tracks. Level of pigment dispersion usage will vary depending on degree of color tinting desired. A standard guideline is 1 pint of Pre-Dispersed Pigment for each gallon of latex. Follow application instructions for SportMaster products. View in Catalog 1 gal. Pail 11 lbs. 5 gal. Keg 53 lbs. 55 gal. Drum 590 lbs.